The evening starts as we pick you up at one of the various locations throughout Steamboat and drive you to the ranch. 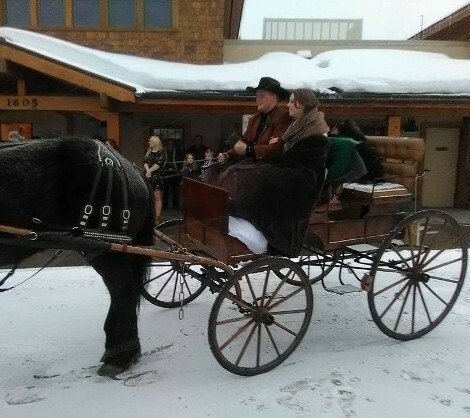 It's a short twenty-minute ride up the Elk River Valley, where the horse-drawn sleighs await. The sleigh-ride trail follows the river through the lower pasture, drifts through the trees, and traverses back down our meadow to the loft of our remodeled barn. There, warm drinks, entertainment, and hospitality await. Dinner is prepared as you warm up, shake off the winter weather, browse the many western artifacts accumulated by our family over the years, and hear traditional western music performed by local artists. Dinner is served, and you sit down to a hearty ranch-style meal. After dinner, there is additional entertainment as you relax to let your supper settle. Our after-dinner entertainment concludes as you bundle up for the sleigh ride back to the bus and the return to town. Reservations are required for all sleigh rides. Quality food and entertainment are our primary concerns. Combining those two items with the horses, stories, and our love of the western lifestyle creates a truly unique atmosphere that has to be experienced. We tend to leave the vast majority of our patrons with very full stomachs and smiles on their faces. We enjoy doing this, and it shows. During the reservation process, we will want to determine the most convenient pickup/drop off location for your party. All of our designated locations have ample parking and are strategically located and easily accessible. We ask that you please be courteous of all guests and please be on time to your pickup location. This is the main area at the foot of the ski mountain on Mt Werner Circle where many shuttles and local buses pick up and drop off. It is our primary location due to the ease of access from of the resorts. We pull up to the curb, not a designated bus lane. This location is mainly used by guests coming to Steamboat from the east or south. We pick up and drop off at the bus shelter located in the middle of the Safeway parking lot. The Wells Fargo location is mainly used for anyone staying downtown. It is easy to walk to and centrally located. We pick up and drop off in the back parking lot north of Wells Fargo (across from the post office). The guests we pick up here are mainly traveling into Steamboat from the west. We recommend that you park near the large propane tank and we will meet you there. *Occasionally we have guests that wish to drive out. Please note, parking is limited at the ranch in the winter and ensuring that ALL guests arrive simultaneously is very important. If you decide to drive out, we will still want to meet you at one of the designated pickup locations and have you follow us out so we can be sure everyone finds their way and arrives at the same time to board the sleighs.